Fiona Peart shares her beautiful and innovative painting techniques for watersoluble media. Whether you have pencils, paints or colour sticks, it can be used to stunning effect with this book. Fiona Peart's work is innovative and inspiring, using many different types of watersoluble media on their own and in combination. In this book Fiona guides you through four essential ways of working with watersoluble media; each of which can be applied to whatever you have in your cupboard at home – whether you have inks, watercolour or acrylic paints, watersoluble pencils or sticks – and they even encompass multimedia collage. Includes illustrated step-by-step example paintings and techniques for ease of use. Open this book and come into the vibrant and fresh world of watersoluble media! This is a book that deals with medium that involves the use of water. It gathers a lot of materials and ideas together and Fiona presents a colourful and informative guide to a variety of tools that sit happily under the same umbrella. Beginning with the use of water both for blending and for washes, she gradually moves through different techniques, from dry-on-dry to wet-on-wet and stopping of at various waypoints on the journey. This book may not instruct the more experienced practitioner, but it has much that can delight and divert them - Henry Malt. 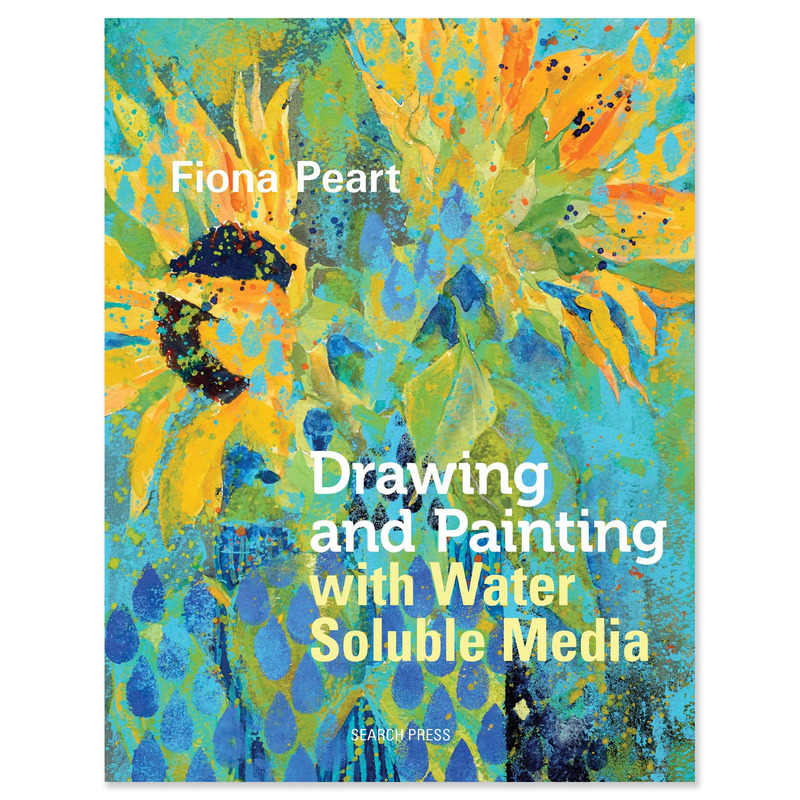 Devotees of Fiona Peart will be delighted to hear that her new book, Drawing and Painting with Water Soluble Media, is now available from Search Press. Fiona's aim is to show you how to enjoy using water-soluble materials in new and exciting ways, unlocking creative potential with an array of materials that you will probably already have lurking in the back of a drawer. One who chapter is devoted to the properties of each of the water soluble materials used, including colour pencils, colour sticks, paints and inks, surfaces, tools for applying colour, materials to protect the surface, and materials to use for different effects, while another deals with techniques. Most of the rest of the book is taken up with step-by-step projects and demonstrations for you to follow or explore with your own choice of water-soluble materials and techniques. Fiona is an experiences art tutor, who understands the problems artists face, so if you are looking for inspiration to liven up your work, then this is the book for you. Fionas in her element with this intriguing and exciting book. Im glad to have finally laid my hands on a finished copy. The first proofs I saw were quite low-resolution and didnt do justice in any way to what are some very subtle images that exploit the possibilities of pencils, colour sticks, ink, watercolour, acrylic and gouache to the full. Theres a very nice progression from the properties of the various materials you do need to know what to use when and experimenting with them. Fiona then moves quickly on to the creative journey, which shows you how to use various materials for pictorial effect. What I particularly like about the book is the fact that there are no technical exercises that are there just for their own sake; everything finishes up in a painting that captures the elements of the scene and has you thinking, youre right, no other medium could have done that. If youre familiar with the lavender fields at Snowshill in the Cotswolds, youll know how, although they demand representation, theyre really tricky to capture convincingly. For this panoramic painting, bold pigment was drawn onto the paper, then sprayed with clean water and left to settle into the surface. The result is an assault of colour, exactly as you get in life, but with little attempt at detail. Its exactly the way to go about it, I now know. The book is full of ideas, projects, hints and tips, demonstrations and simple wisdom. Its a real feast of painting and of imagination and should open up a world of possibilities. Vibrancy is the key term which springs to mind when reading this book. Colours are used to bring life and vitality to images by using water soluble media. Be these pencils or paints. This is a how to book and the one thing to be careful of is don't drown your book when following the steps. This book has an element of fun and leaves you wanting to go draw on something- be it paper, canvas or that wall you havnt papered yet. This is isn't about being perfect but having a go, so why not- have a go!